On our next Vendor Spotlight allow us to introduce you to DeSheri and Brooke from the Pensacola wedding makeup and nail salon, DESHI. They believe in a non-toxic way of life. 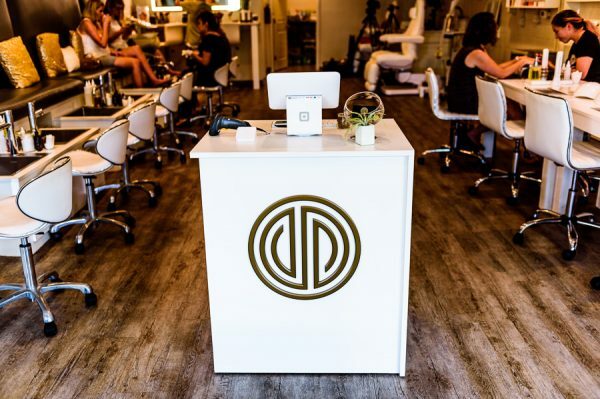 Their salon specializes in providing clients with the healthiest cutting edge nail care + design. 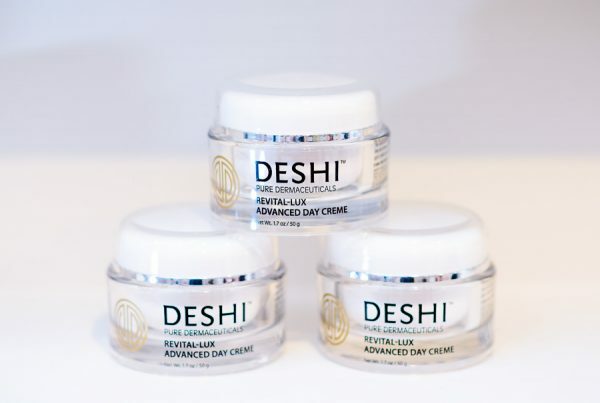 They also provide medical grade skin care and pride themselves in providing products that leave out harsh chemicals and replace them with natural ingredients! Here are the highlights from our interview with DeSheri and Brooke! (Lazzat) Tell us a little bit about your service, how did it all start, how did we get involved in the wedding industry? 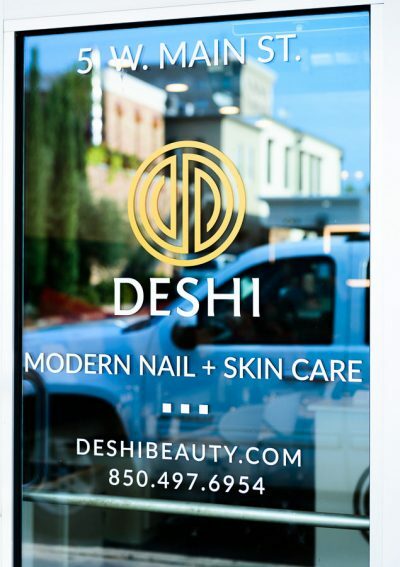 (DeSheri) Well, first I became a makeup artist about 17 years ago and I really enjoy doing bridal makeup, that was one of my favorite things to do. When I moved to Pensacola Florida (I grew up in the DC area) you had to have your aesthetic license in order to perform makeup services here, so I went through the aesthetic program at Pensacola State College and got my license. In that I really delved into skin care and more into the nontoxic beauty, so the trend of organic eating and all that was on the uprise and then learning in school that we digest 60% of what we put on our skin in 24 seconds started making me think – “What’s in my products, not just what’s in my food that I’m eating?” . So as we began, me and my husband, we started having children and I was a little bit more conscious of what I was putting on my body during pregnancy. We started with a store on Bayou and we did non-toxic services there where we did manicures, pedicures, facials, and everyone loved the pedicures and I said: “man if I can get downtown and have more techs doing this I think this could be really great!”. It took us about two years to get to that point and in a couple more days we’re going to be celebrating our first year open, it’s so exciting! We offer non-toxic services so we don’t classify ourselves as organic because most products there could be 100 different ingredients and two will actually be organic and it will be considered organic when it’s really not. We want to focus on the toxins, so from our pedicures or manicures, our skincare our makeup everything is non-toxic that we do. And then in growing that we’ve just been able to do some great bridal makeup, been featured in a lot of local magazines, made cover for a lot of great brides and it’s just been really dear to us because I think when you’re able to spend that moment with someone – like you get married, that’s one of the biggest days of your life, you spend a lot of money on that day, and just to be able to be there and see the person transform into the last part, because makeup is pretty much the last part that they do before they step into their dress. How many times have we gone to weddings and watch the bride step into her dress and we’re all in the background crying just because it’s so special when the dad sees his daughter about to get married at such a beautiful moment that we get to share with people. Absolutely, I love doing the first look with dad! I always tell my brides that you have to allocate at least a couple of hours for your hair and makeup on your wedding day. Most of the times they say ‘two hours? that’s a lot of time.’ and I say ‘it’s very special not your regular typical daily makeup. So would that be the correct information? Absolutely, so one thing that we like to do which I’m sure you do as well is education. You educate your customers, I mean most people which I can attest for doing this, it’s the stoplight makeup. I’m very busy running a store, running a family, just everything. I may get a little base on at home, but it’s mascara at the stop light, whatever I can do a stoplight and I’m good to go. But this day is actually a signature look that’s what we try to explain to our customers is that it’s a signature look so we have them come in for a trial run and we let them know it’s about 45 minutes to an hour session with our people because we want them relaxed. We want them enjoying themselves, taking pictures of that moment, you want to capture these memories in such a form, so it’s absolutely correct that they need that time for them to get ready. I mean it’s the biggest day of their life, potentially, and you’re spending a lot of money on it, so look your best! Absolutely, so do you guys help the brides with choosing what kind of makeup they should be applying on the wedding day? Should it be more expressive than their usual daily makeup? How extreme should they go on their wedding day when it comes to hair and makeup? During the trial run. I mean, it could take up to two hours on someone because they thought that this is the look that they wanted but in actuality, when it gets on them, it’s not. But I’ll say, probably 80% of the time a lot of them don’t know what they want because they’re not used to wearing makeup like that, you know? So they say “do what looks great on me” and we’ll do it and nail it 100% of the time. But the people that have a look in mind, we definitely like to show them, this is what the look is going to look like on you and this is what we think that would look really great on you, to give them options. Absolutely, so are the trial runs usually included in all of your wedding collections or is it an add-on option? It’s an option they get to choose. So that’s one thing that a lot of ladies like to do, whether they have their bridal portraits coming up, whether they have their bridal luncheon, whether they’re going to the rehearsal dinner the night before, it’s a moment that they can come in and get their makeup done and not just wear it and say this is gonna look good but wear it and have a purpose for it! Get your money’s use out of it. And then we always include lashes, which a lot of people upcharge for lashes, we don’t upcharge for lashes. A lot of people say, “I don’t really want lashes” but you do want lashes. Lashes, you’ve seen it, the eyes transform! They don’t have to be heavy and look too much they can just be a real natural look, but it really just opens up your eyes and looks great in pictures. Transformed! What’s the best way to remove wedding lashes? So the way that we apply them, which is the proper way, they don’t attach to your actual lash they attach to your lash line. You pick at the side and it literally peels right off, you’re not gonna lose any lashes, it’s not going to burn, it’s not going to irritate you, nothing can you just pull it. I’ve had several brides that have decided to wear them through the night and wanted to look pretty, so I said “you’re going to have to sleep pretty” you know, so that you look good in the morning and they’ll say “my lash ended up on my new husband’s back, arm, shoulder”. So we recommend taking them off. (Brooke) One of the things that we do here that’s a little bit different also is that we don’t use a thick lash glue, we use a lash adhesive. The drying time is much less, you don’t feel it and that’s really important especially on your wedding day. The last thing you want to do is be able to see your lashes so it blends well, a lot of times you don’t even know that they’re there. Like those first 5 to 7 minutes they feel like “Snuffleupagus” lashes but after that, they change. So you focus on organic materials through and through? (Brooke) Yes, absolutely, the whole process. Even the makeup that we use for our bridal makeup, we use a lot of cancer certified makeup. Our products are made to enhance, I mean you soak in everything so you don’t want to wake up the next morning after your wedding with acne or things like that. And a lot of people have experienced that, even myself. That’s why I started researching the non-toxic, mineral-based makeups and there was definitely a trend for a long period of time where “airbrush makeup is the makeup that you did for your wedding because it’s glue on your face” but the actuality of it is a nontoxic, mineral-based makeup will last just as long if not better and it’s actually doing something beneficial for your skin. We have had several people whether they were on camera for TV shows, and were doing makeup and their face breaks out every time they use a certain brand, and I say that brand has a lot of chemicals and a lot of color dies which your skin doesn’t like. Some people break out in eczema, some people break out in psoriasis, dry skin, acne, cystic acne just because of ingredients that are in products so our brides love the fact that we can do a makeup look where it doesn’t have to be full of toxins. As she was saying, they can wash their face off in the morning and not have a pimple the next day because it’s a clean makeup and one of the ladies asked me one time “is this makeup going to last because you know it has to last” and I said ‘I promise you it will last. It’s a great makeup line, I promise you our setting sprays & everything is just really great’. The next week she got back from her honeymoon, she sent me a picture she had cake all over her face. I think it was the worst cake fight I have ever seen at a wedding and she was like “do you know I wiped the cake off my face and my makeup was still on!” and I was like “that’s good makeup!”. About on-location services, do you offer them? Is it included in the price? How much would you charge to come, let’s say to a hotel, is there a mileage fee? So all in the local area we do charge a location fee because our artists have to leave the building, but people are more than welcome to come here to get their makeup done. If it makes sense and it’s a little easier for them, we go on-location and we charge just a flat fee of $150 to go on location. 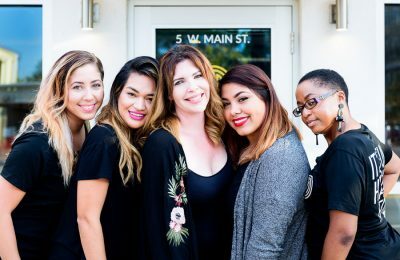 Whether you have 18 people getting their makeup done or six people getting their makeup done it’s just a flat fee that we charge. We really like to do the mother of the bride or the mother of the groom first because they never like to have a bare face when the photographer shows up, so we make it a priority to take care of Mommies, Aunties, whoever so that they can be ready for the day. Then we’ll go to bridesmaids, and then we saved the bride for last so she can get right from makeup to her stepping into her dress. (Brooke) We just had one of those weddings – it started early at 7 am, they started getting their hair done and they just sent them over one by one so depending on how many say it’s 10 it really also depends on the hair and what they are doing style wise. But right after hair if we have to be here early. Of course, we don’t mind. When it’s a big day, it’s a big day. Typically, I mean we can do, Bridesmaids, mother of the bride, we like to allocate maybe 30-40 minutes per person for their makeup. As far as hair, that will be determined on the style that they get which can go anywhere from 30 minutes to an hour per person. For the bride, I love to just set out 45 minutes to an hour. Typically it’s really hard for the bride to sit any longer than that, you know? It’s her Big Day, and we are going to give her everything that she wants! That’s what we want to do. A lot of people go “gosh I wish I could just get a mask like this for the weekend, I wish I could do something in between” so we’ve been in the process of trying to come up with that, and what we can provide our customers. When they come into the store they can’t take stuff home that works with them. A random fact about your business? So, I have one: Deshi is Japanese and it actually means “student” or “disciple”. We pride ourselves in the education factor, we pride ourselves as people working here in a place of always learning, always being a student, so if we can always live our life like that then you’re always going to grow and so doing that, that’s the same thing that we want to portray to our customers is the education. So DESHI means student, we always want to live our life as a student! That’s very interesting and beautiful. Do you offer services to grooms or only brides? (Brooke) This is something when we first were pushing facials and things like that, we decided to fall into the beard trend. So we actually offer facials for men, we offer pedicures for men. But we also offer beard facials for men that includes a high frequency with a beard comb, it’s super fun. It’s something the bride and groom can do together to get ready for the day or he can do by himself or with his groomsmen. (DeSheri) It’s always fun watching the grooms sitting on the bench. (Brooke) It’s so much fun! And sometimes they’ll do something cute too, they’ll get their wife’s initials like painted on their toe, it’s just something fun, you know that actually happens. We are really lucky because I think Pensacola is getting to the point where men aren’t scared to take care of themselves and we see that so much more lately. Actually, we had a groom in here the other day who walked in on his wife’s little bachelorette party. It was really fun, he hung out, drank champagne, put his feet in a tub. So yeah, it’s brides and grooms. Tell us a little bit about your products. Two years before we actually opened the store I worked with a team. It was a scientist and a chemist and I wanted to create our own skincare line. So working with different plastic surgeons over the years, one of the things that I saw was that the products actually had a lot of parabens and sulfates and a whole bunch of filler that didn’t do anything for the skin. It was just so that they could make a mass quantity of them and it could be in a warehouse. I wanted to create a non-toxic, medical grade skin care line which isn’t really out there yet so it’s kind of a baby to me personally. But we launched it when we opened the store about a year ago and it’s going great. It is a medical grade skincare line without harsh toxins. It’s not organic, it’s not completely free, it’s not a whole bunch of essential oils and all that. It’s an actual medical grade skin care line, so it’s going to help with hyperpigmentation, it’s going to help with re-surfacing, it’s really geared towards those of us who want to reverse the signs of aging. That’s amazing! So how do brides find you? Thank you so much guys for being a part of our Vendor Spotlight and sharing your stories about your store, the services, and the products. I really loved getting to know you and talking about the brides, grooms and the weddings. Thank you, I really appreciate it! (Brooke) Thanks for coming in! What a great and informative interview this was! 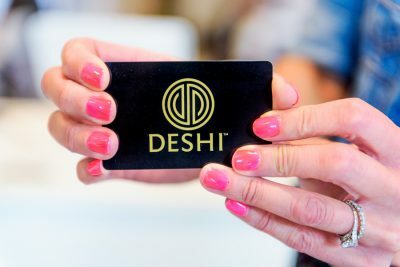 Thank you again to DeSheri and Brooke from DESHI, and Kevin Houghton with Rising Sun Video Productions for filming and production of the interview.